Though born in Delaware, she considered herself a Philadelphian by the time she became active in the suffrage movement. 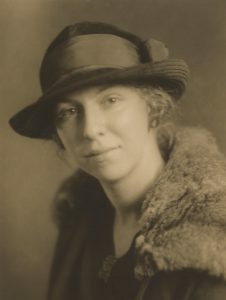 After graduating from the University of Pennsylvania’s School of Sociology, she worked at the State Home for Girls in Trenton, New Jersey, then was employed by the Traveler’s Aid Society in Philadelphia before going to Washington, D.C., to join the “Silent Sentinel” demonstration of November 10, 1917. Picketing of the White House had begun on January 10th, and arrests had been common since June 22nd, but Lincoln’s introduction to the picket line was still on a remarkable day. The authorities hoped that long sentences imposed on previous pickets would put an end to the demonstrations, but it had the opposite effect. Never before had as many as 41 pickets been arrested at once, and the military precision with which each of the five contingents alternately marched to the East and West gates of the White House impressed even the usually hostile crowd. Lincoln was in the second detachment of nine protesters whose objective was the West Gate. After refusing to give up their right to peacefully protest, all were arrested, loaded into the “Black Maria” police van and taken off for booking, then each released on $25 bail, pending trial. After the usual courtroom farce, all those who went to trial on November 14th were convicted of “blocking traffic” on the wide Pennsylvania Avenue sidewalk. They refused to pay their fines, so she and almost all the others were immediately, and as it would turn out, illegally, sent to Virginia’s Occoquan Workhouse. Sentences ranged from six days to six months, with Lincoln getting 30 days. When Superintendent Whittaker and a number of guards burst into the room where the women were to be processed, Lincoln recognized him immediately: “He has stiff white hair, blazing little eyes, and a dull little birthmark on the side of his face,” she wrote in her diary. After four days in a cold cell, and without having eaten any food, Lincoln noted: “My back seems to be breaking and the dull pain in my head becomes unbearable.” The next day she was taken to the prison hospital, where she could hear what she believed to be nearby sounds of force-feeding, and wondered if she would be next. Before the end of November, public pressure caused all the suffrage prisoners to be released. Her ordeal certainly didn’t discourage her from further activism, as she did work for the National Woman’s Party for several months, and she won a coveted “Prison Pin” from the party as well. On May 3, 1918, she and Mollie Condon, an organizer for the National American Woman Suffrage Association, and then the National Woman’s Party, arrived in Reno, Nevada, to “study practical politics” and help elect Anne Martin as the first female U.S. Senator. Though the campaign was unsuccessful, Martin still got 18% of the votes cast, despite running against the two major party candidates as an Independent. By January, 1920, Lincoln was living in New York City, earning a salary as an “organizer,” so her commitment to activism never wavered despite prison time and a campaign setback. That brings from the ends of a great country Women of all ages, Who place a remote freedom for every sister Above a near personal liberty, And above the cant of criticism. Sources: “A Woman’s Crusade: Alice Paul and the Battle for the Ballot” by Mary Walton, pages 197 – 201; “Jailed for Freedom” by Doris Stevens, pages 193 & 364; New York Times, November 11, 1917, “Arrest 41 Pickets for Suffrage At the White House,” Page 1 Col. 1; Los Angeles Daily Times, November 11, 1917, “Suffragists Arrested at Capital,” Part 1, Page 3, Col. 1; Nevada State Journal, May 4, 1918, “Come from East to Study Politics,” Page 8, Col. 4; 1920 U.S. Census, Richmond Borough, NY, S.D. 3, E.D 1544, Sheet 15 B; Social Security Death Index, 1935-2014.